[122 Pages Report] flavors & fragrances market was valued at USD 20.55 Billion in 2016 and is projected to reach USD 24.13 Billion by 2022, at a CAGR of 2.67% during the forecast period. The base year considered for the study is 2016, and the forecast period is from 2017 to 2022. This technical, market-oriented, and commercial research study involves extensive use of secondary sources, directories, and databases, such as Hoovers, Bloomberg BusinessWeek, and Factiva, to identify and collect information on the flavors & fragrances market. Primary sources mainly include several industry experts from the core and related industries and preferred suppliers, manufacturers, distributors, service providers, and organizations related to all the segments of the industry’s supply chain. After arriving at the overall market size, the total market has been split into several segments. 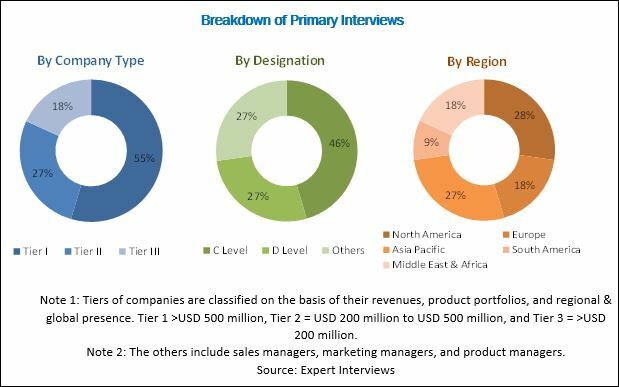 The figure below illustrates the breakdown of primary interviews based on company type, designation, and region conducted during the research study on the flavors & fragrances market. Key market players profiled in this report include Givaudan (Switzerland), International Flavors & Fragrances (US), Firmenich (Switzerland), MANE (France), Symrise (Germany), Sensient (US), Takasago (Japan), Frutarom (Israel), Robertet (France), and T.HASEGAWA (Japan). The flavors & fragrances market is expected to grow from an estimated USD 21.15 Billion in 2017 to USD 24.13 Billion by 2022, at a CAGR of 2.67% between 2017 and 2022. Growing population, rapid urbanization, and increase in per capita spending on food and consumer products in emerging economies such as China, India, and Indonesia are driving the demand for flavors & fragrances. In addition, growing awareness among populations related to health and hygiene is expected to drive the flavors & fragrances market during the forecast period. On the basis of ingredients, the flavors & fragrances market has been segmented into synthetic and natural. The synthetic ingredients segment is projected to lead the flavors & fragrances market during the forecast period due to the low cost and growing usage in end-use products such as beverages, packaged food products, home care products, and personal care products. Based on end use, the flavors market has been segmented into beverage, savory & snacks, bakery, dairy products, and confectionery, among others. Beverages is estimated to be the largest end-use segment of the flavors market during the forecast period. The demand for flavors for beverages is mainly due to the growing demand for soft drinks, energy drinks, and other drinks. In addition, aspirational purchase of global drink brands is also driving the demand for flavors for beverages. Based on end use, the fragrances market is segmented into consumer products and fine fragrances. 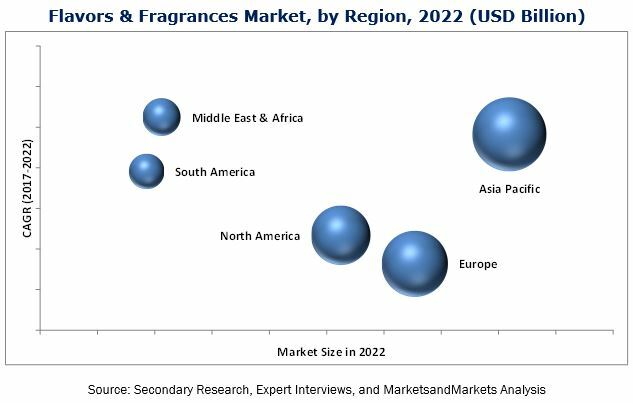 Consumer products is estimated to be the largest end-use segment of the fragrances market during the forecast period. The high demand for consumer products is mainly due to the rise in disposable incomes; growing urbanization; the rise of organized retail chains; changing lifestyles; and increasing awareness related to hygiene and cleanliness created by advertisements, which is adding to the overall growth of the consumer products segment. The flavors & fragrances market has been studied for Asia Pacific, Europe, North America, the Middle East & Africa, and South America. Asia Pacific is the largest flavors & fragrances market globally, due to the rising population, rapid urbanization, and increasing per capita incomes of consumers which enable them to buy various fast-moving consumer goods, such as packaged foods, dairy products, baked goods, and beverages, among others. Moreover, the increasing demand for a variety of food products and other consumer goods due to the rapidly growing food & beverage and cosmetic industries is fueling the growth of the flavors & fragrances market in the region. One of the key factors restraining the growth of the flavors & fragrances market is the stringent regulations for flavors & fragrances by different government entities, such as European Food Safety Authority, Flavor & Extracts Manufacturers Association (FEMA), US Food and Drug Administration (FDA), and China Food, Drug Administration (CFDA), and International Fragrance Association (IFRA). Companies are focusing on strengthening their positions in the flavors & fragrances market through expansions, acquisitions, and new product launches. Major players active in the market include Givaudan (Switzerland), International Flavors & Fragrances Inc. (US), Firmenich (Switzerland), MANE (France), Symrise (Germany), Sensient (US), Takasago (Japan), Frutarom (Israel), Robertet (France), and T.HASEGAWA (Japan). 10.11.4 Ogawa & Co., Ltd.